The Make-A-Wish Foundation® was founded in the USA in 1980. Its mission is to fulfill the wishes of severely ill children from 3 to 18 years in age. Whatever the wishes may be, they all have one thing in common – if they are granted, the children gain renewed courage and are able to forget about suffering and illness for a while. The DDr. Heinrich Foundation® sponsors the granting of specific wishes. In cooperation with the Make-A-Wish Foundation® team, they are able to cut through the bureaucracy and fulfill the children’s wishes quickly. I really want to say thankyou for the lovely evening in my favourite pizzeria. I am now one of the first Austrian girls who can call the new Galaxy Tab 10.1 her own… the long wait has been rewarded! Here is an impression of the certainly most exciting day of my life until now :-). This feeling when walking by thousands of crazy fans, straight through the crowd where usually only rarely anybody is allowed to come in is fantastic, the people were very friendly, obliging and not a bit overbearing. 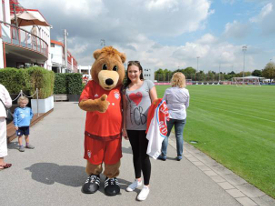 As soon as we arrived at the wooden terrace we already saw them, FC Bayern Munich, one of the world’s best soccer teams, just training, one look to my brother was enough to realize what was happening inside of us. After about 1½ hours training was over, around the soccer field hundreds of people who were shouting after their idols, the players ran a few laps for signatures in addition – then the players who are normally just known from TV or the Internet came. Everybody was content to make pictures for and with us – signatures and small talk; after all I cannot really tell what my special highlight was, because the whole day was priceless. Very special thanks to Sara who has accompanied us, to Make-A-Wish, and to all of those who had helped to make this dream come true! In the scope of our Make-A-Wish sponsorship, we were able to grant the wish of our “make a wish” child Marcel. Marcel was severely ill and all he wanted was an iPhone. He and his mother and sister went to a pizzeria. At first he was skeptical when the waiter arrived bearing a big cheese cover. But what a surprise when Marcel found a brand new iPhone in amongst the napkins! With this small contribution, we hope that we were able to bring some joy into Marcel’s life in spite of his hard fate.